So we can talk about 6C33. But here is something different. How the famous Western Electric glues their tube bases. Mmm...?! 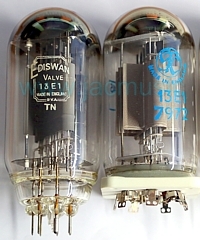 An curious bright emitter tube, wich can be used for HiFi at only 350V. can it replace 12AU7 / ECC82? Electro Harmonix, but just Russian 6922 by Reflektor. Quality was always an issue, and guarantee also. So I have many broken ones to play with. The 'gold' is only on the printing and on the pins. On the grid, I could see no gold. Secret Audio Tip! Beautiful DHT Triodes, made by Philips, during WW2. Like all WW2 tubes, supreme quality. Article about the most wanted small tube. 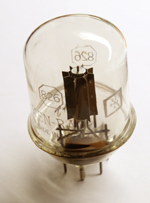 This is a family of tubes, some in octal base some in 7 Pin miniature, some with 6.3V heater, some with 20V, which have similar tube curves. Excellent Hifi tubes, all of them. This is a giant Russian version of AD1. Unknown, secret tube. Costs even a fortune in the Russian collectors scene. Why people use 845 or 211 from China, with all those quality problems, such as loose anode contacts, broken heaters, and low lifetime? While you can buy real NOS GM70? I really I don't know! History of the KT88 tube. TESLA EL34. NOS from the 1960's. Made by TESLA, in Rosnov factory. VT-25-A There is no datasheet.